This article is about the Battle of Sedan in the Franco-Prussian War. For the World War II battle, see Battle of Sedan (1940). The Battle of Sedan was fought during the Franco-Prussian War from 1 to 2 September 1870. It resulted in the capture of Emperor Napoleon III and large numbers of his troops and for all intents and purposes decided the war in favour of Prussia and its allies, though fighting continued under a new French government. The 130,000 strong French Army of Châlons, commanded by Marshal Patrice de MacMahon and accompanied by Napoleon III, was attempting to lift the Siege of Metz, only to be caught by the Prussian Fourth Army and defeated at the Battle of Beaumont on 30 August. Commanded by Generalfeldmarschall Helmuth von Moltke and accompanied by Prussian King Wilhelm I and Prussian Chancellor Otto von Bismarck, the Fourth Army and the Prussian Third Army encircled MacMahon's army at Sedan in a gigantic battle of annihilation. Marshal MacMahon was wounded during the attacks and command passed to General Auguste-Alexandre Ducrot, until it was taken over by General Emmanuel Félix de Wimpffen. Pulverized from all sides by superior German artillery firepower and with all breakout attempts defeated, the French Army of Châlons capitulated on 2 September, with 104,000 men passing into German captivity along with 558 guns. Napoleon III was taken prisoner, while the French government in Paris continued the war and proclaimed a Government of National Defense on 4 September. The German armies besieged Paris on 19 September. After its defeat at the Battle of Gravelotte on 18 August, Marshal François Achille Bazaine's 154,481-man Army of the Rhine retreated to Metz where it was surrounded by 168,435 Prussian troops of the First and Second Armies in the Siege of Metz beginning on 19 August. Emperor Napoleon III, along with Marshal Patrice de MacMahon, formed the new French Army of Châlons on 17 August to march on to Metz to rescue Bazaine. With Napoleon III personally leading the army, and with Marshal MacMahon in attendance, they led the Army of Châlons after 23 August in a left-flanking march northeast towards the Belgian border in an attempt to avoid the Prussians before striking south to link up with Bazaine. The Prussians had repeatedly outmaneuvered the French in the string of victories through August 1870, and the march both depleted the French forces and left both flanks exposed. The Prussians, under the command of von Moltke, took advantage of this maneuver to catch the French in a pincer grip. Leaving the Prussian First and Second Armies besieging Metz, Moltke took the Prussian Third and Fourth Armies northward where they caught up with the French at the Battle of Beaumont on 30 August. After a major defeat in which he lost 7,500 men and 40 cannons, MacMahon aborted the planned link-up with Bazaine and ordered the Army of Châlons to withdraw north-west towards the tiny, obsolete 17th-century fortress of Sedan. His intention was to rest the army, which had been involved in a long series of marches, resupply it with ammunition and, in his words, maneuver in front of the enemy. MacMahon underestimated the German strength and believed the hills surrounding Sedan would offer him a major defensive advantage. The French rear was protected by the fortress of Sedan, and offered a defensive position at the Calvaire d'Illy, which had both hills and woods to provide cover for any defense. MacMahon denied a request from General Félix Douay, commander of 7th Corps, to dig trenches, claiming the army would not remain at Sedan for long. Upon arrival in the vicinity of Sedan on 31 August, MacMahon deployed Douay's 7th Corps to the north-west on the crest between the Calvaire and Floing. Auguste-Alexandre Ducrot's 1st Corps faced east, while Lebrun's 12th Corps garrisoned Bazeilles. The recently-arrived General Emmanuel Félix de Wimpffen took over command of 5th Corps from Pierre Louis Charles de Failly, the unit having been routed at Beaumont. 5th Corps was placed in reserve in the centre. Moltke divided his forces into three groups: one to detain the French where they were, another to race forward and catch them if they retreated, and a third (the smallest force) to hold the river bank. The Saxon XII Corps crossed the Meuse to the Chiers, with the Prussian Guards on their right. The I Royal Bavarian Corps under General Baron von der Tann moved up to Bazeilles and the Bavarian engineers threw up two pontoon bridges across the Meuse to secure their way across. The Prussian V and XI Corps completed the encirclement of the French army to the north-west by 0900 on 1 September. "Now we have them in the mousetrap." The battle opened with the Army of Châlons, with 202 infantry battalions, 80 cavalry squadrons and 564 guns, attacking the surrounding Prussian Third and Fourth Armies, which totaled 222 infantry battalions, 186 cavalry squadrons, and 774 guns. "We are in the chamber pot and about to be shat upon." Napoleon had ordered MacMahon to break out of the encirclement, and the only point where that seemed possible was La Moncelle, whose flank was protected by a fortified town. The Prussians also picked La Moncelle as one point where they would mount a breakthrough. Prince George of Saxony and the Prussian XI Corps was assigned to the task, and General Baron von der Tann were ordered to attack Bazeilles on the right flank. This was the opening engagement, as the French 1st Corps had barricaded the streets, and enlisted the aid of the population. Von der Tann sent a brigade across pontoon bridges at 0400 hours in the early morning mist, the Bavarians rushing the village and capturing it through surprise. The French Marines of the 1st Corps fought back from stone houses and the Bavarian artillery shelled the buildings into blazing rubble. The combat drew new forces, as French brigades from the 1st, 5th, and 12th Corps arrived. At 0800 the Prussian 8th Infantry Division arrived, and von der Tann decided it was time for a decisive attack. He had not been able to bring artillery to bear from long range, so he committed his last brigade to storm the town, supported by artillery from the other side of the Meuse. His artillery reached Bazeilles at 0900 hours. The fighting continued to spread to the south of the town, and the 8th Infantry Division was sent to reinforce the Bavarians fighting at La Moncelle, where they had tried to break through the French defense. Fighting began in earnest at 0600, and the wounded MacMahon had appointed General Ducrot to command, who received the news at 0700. Ducrot ordered the retreat that Moltke had expected, but was overruled almost immediately by General Wimpffen, who had been given a commission by the government to succeed MacMahon were he to become disabled. Wimpffen then threw his forces against the Saxons at La Moncelle. This led to a brief rally for the French, who drove back the artillery around La Moncelle and pressed the Bavarians and the Saxons. However, with the taking of Bazeilles at 0800, and the arrival of fresh waves of Prussian troops, the counter-attack began to collapse. By 1100 hours, Prussian artillery took a toll on the French, while more Prussian troops arrived on the battlefield. The Prussian V and XI Corps reached their designated positions to the west and north-west of the French army by 0730 and 0900, respectively. A French cavalry unit advancing west was slaughtered by Prussian infantry and artillery fire. The Prussian artillery batteries took up positions along slopes overlooking the French army. The Prussian Guards at the battle. Nonstop German artillery fire on the helpless French infantry and artillery, Prussian attacks from the northwest and east and Bavarian attacks from the southwest drove the Army of Châlons north into the Bois de la Garenne, where it was surrounded. Wimpffen at 1300 gave orders for a breakout to the south. The attacks failed completely or did not get going at all and Douay's 7th Corps front line was broken under the weight of German firepower. Douay's left flank had been dug in in two lines of trenches above Floing, their fire keeping the Germans pinned down in the village. By 1300, the German artillery had destroyed Douay's and the German 22nd Division turned Douay's left flank, defeating all counterattacks by French infantry and lancers. Douay directed General Jean Auguste Margueritte's cavalry squadrons to open an escape route by launching three desperate attacks on the nearby village of Floing where the Prussian XI Corps was concentrated. Margueritte was mortally wounded leading the very first charge, and the two additional charges were mowed down by German infantry fire at 1500, the number of French killed and wounded amounting to 791. A mural painted in 1884 by Carl Steffeck depicts General Reille delivering Napoleon III's letter of surrender to King William I at the Battle of Sedan on 1 September 1870. It was at the former Ruhmeshalle in Berlin and was destroyed by bombs during World War II. By 1400, the German infantry had seized the Calvaire and opened fire on the huddled French masses in the Bois de la Garenne. The Germans then closed in for the kill from all sides. The French 7th Corps under Douay dissolved into a panic-stricken horde, seeking refuge in Sedan while pounded by German artillery. Ducrot's 1st Corps was routed by the artillery of the Saxon XII Corps and the Prussian Guards Corps. The Bois de la Garenne was subject to constant German artillery fire from multiple sides and when the Prussian Guards infantry captured the forest at 1430, the French survivors inside it surrendered en masse. By the end of the day, with no hope of breaking out, Napoleon III called off the attacks. He ran up the white flag on the fortress walls of Sedan and sent General André Charles Victor Reille to deliver a letter of surrender to the Prussian Royal Headquarters, situated on the hillside above Frénois. Wilhelm and Bismarck read the letter and Bismarck accepted it. Wimpffen attempted a last-ditch negotiation maneuver, seeking an "honorable capitulation" over prisoner-of-war status for the Army of Châlons, but Moltke rebuffed him, pointing to the French lack of ammunition and food, the 250,000 troops on the German side against the mere 80,000 fighting for the French and the concentric German position. Wimpffen received only the prolonging of the truce until 0900 on 2 September. By the next day, at 11:30 on 2 September, Wimpffen signed the surrender of himself and the entire Army of Châlons to Moltke and the Prussian King. The French soldiers marched under heavy rain to an improvised German POW camp, where they starved for the next week. On 3 September, Napoleon III left for a comfortable captivity in Schloss Wilhelmshöhe near Kassel. The French prisoners of war viewed his departure with indifference. The capture of the French emperor left the Prussians without an opposing government willing to make a quick peace. Indeed, two days after news hit Paris of Emperor Napoleon's III capture, the French Second Empire collapsed in a bloodless revolution, leading to the creation of a Government of National Defense which would carry on the war for five more months. However, the defeat at Sedan and the capture of Napoleon III and France's second line army, and with the first line French Army shut up in Metz, sealed the doom of France and thus decided the outcome of the war in Prussia's favor. By 19 September, the Prussian Third and Fourth Armies went on to besiege Paris. The Brandenburg Gate lit up on 'Sedantag' in 1898. In English, the sign reads "What a change through God's guidance"
In recognition of the role this battle played in German Unification, many Germans celebrated Sedantag (Day of Sedan) on each 2 September until 1919. The Kaiser himself refused to declare 2 September an official holiday; instead, it became an unofficial day of celebration. The Germans lost 9,942 men, with 1,310 killed, 6,443 wounded and 2,107 missing. The French Army of Châlons suffered 122,000 casualties, including 3,220 killed, 14,811 wounded and 104,000 captured along with 558 guns. The French army lost a further 1,000 wagons and 6,000 horses to the Germans. ^ a b c d e Clodfelter 2017, p. 185. ^ Howard 1961, p. 150. ^ Howard 1961, p. 160. ^ a b Howard 1961, pp. 161–163. ^ Howard 1961, pp. 162–163. ^ a b c d e f Howard 1961, p. 163. ^ a b Howard 1961, p. 164. ^ a b c d e f Howard 1961, p. 165. ^ a b c d Howard 1961, p. 168. ^ Howard 1961, p. 145. ^ a b c d e Howard 1961, p. 166. ^ Howard 1961, p. 162. ^ a b Howard 1961, p. 167. ^ Howard 1961, pp. 167–168. ^ Howard 1961, p. 169. ^ Howard 1961, pp. 169–170. ^ a b c Howard 1961, p. 170. ^ Howard 1961, pp. 170–171. ^ a b Howard 1961, p. 171. ^ Howard 1961, pp. 171–172. ^ a b c Howard 1961, p. 172. ^ Zuber 2008, p. 299. ^ a b Howard 1961, p. 173. ^ a b Howard 1961, p. 174. ^ a b c d Howard 1961, p. 176. ^ a b c d Howard 1961, p. 177. ^ Howard 1961, p. 178. Howard, M. (1961). 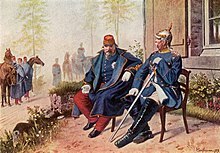 The Franco-Prussian War: The German Invasion of France 1870–1871. London: Rupert Hart-Davis. ISBN 0-24663-587-8. Zuber, Terence (2008). The Moltke Myth: Prussian War Planning, 1857-1871. Lanham, Maryland: University Press of America. ISBN 978-0761841616. Lowe, W. J. The Nest in the Altar or Reminiscences of the Franco-Prussian War of 1870 reprinted by Chapter Two, London in 1999, ISBN 1-85307-123-4. Hervé, B. (2008). Le docteur Henri Conneau et la famille impériale à Biarritz, ou en un autre lieu illustre: Milan, 1803 – La Porta, 1877: médecin particulier de la reine Hortense et de la famille Bonaparte: ami le plus fidèle, confident le plus intime de l'empereur Napoléon III [Doctor Henri Conneau and the Imperial Family in Biarritz or another Illustrious place Milan, 1803 – La Porta, 1877 Private Physician of Queen Hortense and the Bonapartes' Friend Most Faithful, Most Intimate Confidant of Emperor Napoleon III] (in French). Biarritz: Bernard, Hervé. OCLC 762872292. Horne, A. (1965). The Fall of Paris: The Siege and the Commune 1870–71. London: Macmillan. OCLC 490599556.